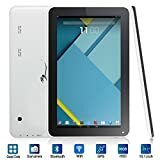 Amazon has the Dragon touch A1X Plus 10.1" Quad Core Tablet PC google Android 4.4.2 KitKat, 1GB ram, 16GB Nand Flash, built-in bluetooth GPS, HDMI, google Play pre-installed, dual Camera, 3D Game Supported, 2015 New Model [ by TabletExpress ] for $105 with free shipping. Sells for $145+ Highest Price. Deals for $89 Lowest Price. Normally $107+. Dragon touch 2015 newest model A1X Plus featuring a robust Quad Core CPU, with 1GB DDR3 pushes you to an impressive smooth 3D gaming and multimedia experience. Advanced core power-saving ability provides extra long battery life. So enjoy yourself with this perfect multi-media! It's equipped withAndroid 4.4 KitKat, which allows faster multitasking and emoji everywhere. Extra features: GPS, bluetooth makes your A1X Plus a powerful multi-media. The 16GB nand flash allows you to download thousands of apps such as FiFa 15, Angry Birds, Fruit Ninja, Temple Run, Quickoffice, etc from google Play Store. While 802.11 b/g/n WiFi keeps you connected on the go. The dual camera design enables you snap pictures, take videos of what's happening in the real world and share with friends via video chatting.built in bluetooth allow easy pairing with a bluetooth-enabled device. Live US local customer service and tech support from TabletExpress. Full 1 YEAR defect warranty! You're covered from any manufacturing defects for 1 year from the puchase of your Dragon touch A1X Plus. Frequently updated firmware guarantees customer satisfaction. What if accidental drop, spill or extended coverage? Add the SquareTrade to fully protect your investment. Feel free to contact us whenever a question pops up in your head, we are always here to help.